Evangelical "Prelates And Prophets" To Create "Shield Of Prayer" Around Donald Trump On Inauguration Day - Joe.My.God. The prophets spoke, the leaders stood up, and the people heard … We repented, we prayed, we declared… and the Lord moved! On a single day in November He shifted the future of this nation and also inspired the Body of Christ with renewed hope! On January 20, 2017 our nation celebrates the inauguration of Donald Trump as the 45th President of the United States. Now God is speaking again: “Surely the Lord does nothing unless he reveals His secret to His servants the prophets.” (AMOS 3:7). 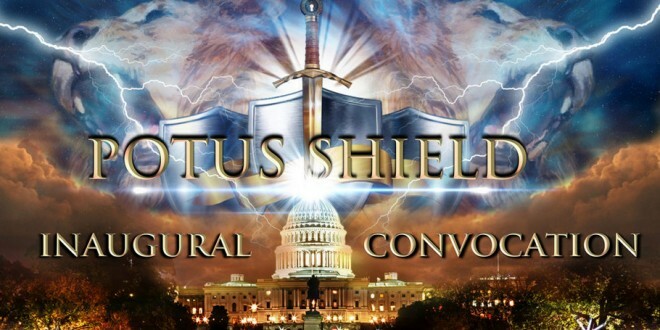 YOU ARE CORDIALLY INVITED TO PARTICIPATE IN THE INAUGURAL CONVOCATION OF THE POTUS SHIELD. Presiding prelates and prophets include: Darrell and Belinda Scott, Frank and Lorilee Amedia, Herman Martir, Rick Joyner, Lance Wallnau, Alveda King, Lou Engle, Cindy and Mike Jacobs, Mark Gonzales, Mosey Modugba, Anwar Fazal, Jennifer LeClaire, and more to be confirmed. Now that is a caravan of cuckoo crazy.